I love flip flops and cute sandals as much as the next girl, but navigating city streets makes it tough to keep my feet in perfect shape. I devised my own love-my-feet routine, and it worked so well, I thought I’d share. 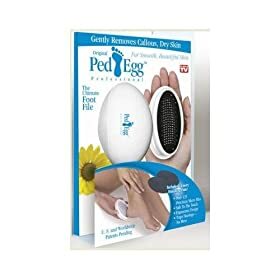 Start by sloughing away dead skin with the infomercial hit, the Ped Egg Pedicure Foot File ($4). After your feet are smooth, apply the drugstore favorite, Flexitol Heel Balm ($9). Then cover your feet with a H20’s Moisture Therapy Socks ($18) for at least 15 minutes. On days when my feet are extra dry, I’ve warmed the sock in the microwave for extra oomph and then worn the socks overnight. And get a break from your party heels at the end of the night with comfy slip-on (cab-friendly) flats.